Barnes & Noble "Nook" e-Reader on Android OS has been rooted (jailbroken) by nookdevs after discovering a DNS hack, followed by physically opening of a nook device. The rooted nook can do everything a rooted Android phone can do, said a source from nookdevs. That means, rooted or jailbroken Nook might able to run apps in future. Developers can tweak the user interface, develop custom ROM's , improve battery life & increase memory of nook, and several other unlocked features in rooted nook are yet to be discovered. Barnes & Noble nook is an electronic book reader based on the Android platform that has been recently introduced to compete with the Amazon Kindle and Sony Reader. Nook supports Wi-Fi and AT&T 3G wireless connectivity, a six inch E Ink display, and a separate, smaller color touch-screen. Follow the guide below to root your nook e-reader. Turn off nook, take off the back cover and then remove the battery. Remove the user microSD card, if any. There are number of tabs around the sides of the nook that release the white bezel. Once released you will need to unseal the glue. There are two black tabs on the sides of the nook where the page turn buttons are. Push those back to unlock them. You should be at the board now. 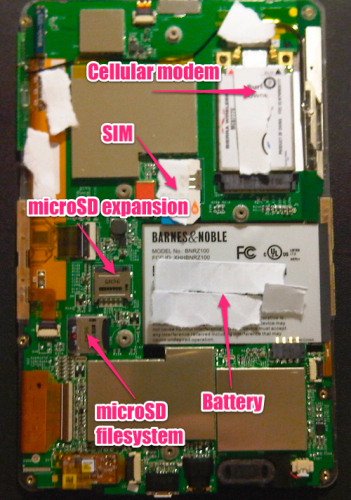 Find the OS microSD card and remove it. Place the microSD card in a adapter, then into a computer. Mount it as ext3 read-write (sudo mount /dev/sdb1 /media/disk replacing values as needed). Open the file init.rc as sudo (sudo nano init.rc). Find the line that starts talking about adbd. Replace the first occurrence of the word disabled with enabled. Eject SD card and then place the SD card back into nook. Close nook up and restart it. Now, on a computer again, download the Android dev toolkit. That�s it!! You have now rooted (jailbroken) your nook.